Studies have proven that SLS causes damage to the oral tissues. This can lead to canker sores and mouth ulcers. As opposed to shampoos and skin care products, toothpaste is often swallowed and SLS can be responsible for an upset stomach and possible Diarrhea. As the mouth becomes dry the pH becomes more acidic and acid promotes the growth of bacteria which causes bad breath. Bad breath is linked to dry mouth, and dry mouth promotes plaque. This can all be avoided by using an SLS Free Toothpaste. While there is no conclusive evidence that toothpastes containing Sodium Lauryl Sulfate cause Canker Sores, there is sufficient evidence to support the theory that SLS can inflame an existing canker sore problem. This is why we recommend using an SLS free alternative such as Jason Natural Sea Fresh Toothpaste, it’s our top recommended brand. Before you buy, be sure to read the label and ingredients as some companies produce both an SLS Free alternative and a toothpaste that contains Sodium Lauryl Sulfate. Most toothpastes contain Sodium Lauryl Sulfate which is a chemical used in toothpaste to create the foaming action. SLS can cause or irritate existing allergies, canker sores and bad breath, which is why an SLS Free alternative is worth considering. Below is a list of some of the most popular toothpastes for sale that do not contain SLS according to customer reviews on Amazon.com. Jason Natural Sea Fresh Toothpaste is a great product that will leave your mouth feeling clean. This toothpaste contains sea salts and minerals for superior whitening qualities. Uncle Harry’s Natural Toothpaste is a unique product that comes in a jar and it’s a fantastic toothpaste. Not only will it clean your teeth, but it will also re-mineralize your tooth enamel. This will give you stronger teeth and less trips to the dentist. It also has the strongest flavor of any brand on our list. Your mouth will feel clean and fresh right after brushing. For some it’s an acquired taste, but others love the taste right from the start. Squigle Tooth Builder Toothpaste has no fluoride and helps reduce sensitivity. Most toothpastes use potassium nitrate to counter sensitivity. This works as a local anesthetic, by calming the tooth nerves. The tiny calcite crystals in the Tooth Builder Toothpaste seal off the open tubules in the teeth. This stops the sensitivity instead of masking it. Tooth Builder Toothpaste is an effective canker sore toothpaste and is equally effective against mouth ulcers. It is free of SLS and Fluoride. Verve Ultra Toothpaste is made in the USA. It’s made with fluoride to fight cavities. It’s vitamin E enriched and contains no animal products. Sensodyne ProNamel Toothpaste is a brand that has been around for decades. Their product is well known for people with sensitive teeth. This formula is neutral pH, meaning it reduces acidity when brushing. Xyli-White Toothpaste Gel is made by Now Foods. The formula includes baking soda and is fluoride free. It’s available in three flavors. Auromere Toothpaste is affordable and it utilizes a variety of herbal extracts that include neem and peelu, otherwise known as the ‘toothbrush tree’s. This company is based in India and they use the ancient Indian healing methods to ensure better health. It’s perfect for those with sensitive teeth. CloSYS Fluoride Free Toothpaste has a combination of ingredients that help to kill bacteria which cause plaque. It also contributes to keeping your mouth fresh for hours. CloSYS has mild polishing agents which help you whiten your teeth and remove difficult stains. CloSys is ideal if you have sensitive teeth or have recently had dental work completed as it is very gentle on teeth. The mild polishing agents are very effective but also very mild on sensitive areas. Dr. Collins All Natural Toothpaste is made up of fine natural ingredients. These include Antioxidants, Superfruits and Vitamins which help oral health. This toothpaste is free of artificial ingredients and preservatives. The toothpaste is also SLS and fluoride free. Natural ingredients like Tea Tree Oil and Magnolia Bark act as a natural antiseptic to fight bacteria and bad breath. The Xylitol helps reduce tooth cavities and the Silica gently polishes and whitens the teeth naturally. If you are concerned about ingesting Sodium Lauryl Sulfate then it’s even more of a concern for children who learn by touching and often tasting. Children are much more likely to swallow toothpaste. The toothpastes listed below are all free of SLS. We recommend starting out with a small order of one of the brands listed below. In our experience some children will love the taste while others will not. It really comes down to personal taste and trial and error. Remember if using an SLS free toothpaste it’s important that your child doesn’t dislike the taste, otherwise they will be reluctant to brush their teeth which can obviously result in a wide range of dental hygiene issues. Baby Bling Toothpaste does not have a lot of feedback but being vanilla ice cream flavored it’s definitely worth a try. It featuring a non-minty taste. The toothpaste was developed by a pediatric dentist (Dr. Janelle Holden) for very young children who are still learning to wash and rinse. It’s completely safe to swallow. NOW Children’s Xyliwhite Toothpaste is a great product at an affordable price. This product not only cleans your teeth— it also helps with cankersores. The NOW brand has a strong reputation for quality products and it’s family owned and operated company. Jack and Jill Natural Toothpaste has no preservatives and completely organic with natural blueberry flavor. This product is Australian made and is also BPA free. The taste is fruity but lacks any real sweetness which may not appeal to all children. Many claim that it smells wonderful but the taste isn’t quite there. Dental health is a serious medical issue for many. Research is constantly being done to discover new ways to improve dental hygiene. Part of this expansion is due to a growing number of people concerned about SLS. SLS free or natural toothpastes may not be as sweet, sugary or foamy as the regular toothpaste containing Sodium Lauryl Sulfate but they are certainly a healthier option to ensure long term oral health. While it could be considered easier to simply remove the foaming agent completely, the products performance would be inhibited. As a result the consumer would be put off by the lack of action. For this reason, products like Uncle Harry’s or Jason’s Sea Fresh toothpaste are a great alternative. Jason’s SLS free toothpaste is made by a company with a long history in ethical and environmental produce. For forty years they have been creating safe cosmetics and toiletries. These products are alternatives to some of the chemical based forms on the market that cause much concern. Every part of what they do is tailored to fit their humane, natural ethos. From the lack of animal testing to the recycling of their packaging. Tom’s of Maine toothpaste contains natural ingredients. It is part of a range of products suited to specific needs with complete transparency over what they use. Due to increased awareness Sodium Lauryl Sulfate Free toothpastes are now in great demand (almost all the major toothpaste brands are producing toothpastes without Sodium Lauryl Sulfate). 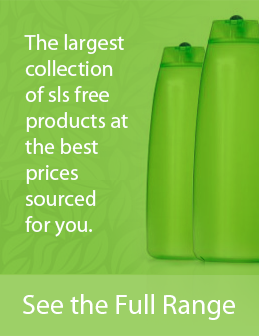 Many of these SLS free brands are also certified as organic. What is Sodium Lauryl Sulfoacetate?